Botanische Jahrbücher 40 (1907) 72. Acaulescent geophyte with scape <1m. Credit: ©Garth Bushell, reproduced with permission of the author. Alternate, prominently veined, lamina leathery, broadly ovate, 120-190 x 140-280 mm, deeply lobed, base truncate, apices of lobes dentate, margins of lobes distantly toothed, ciliate. Petiole up to 240 mm long. Credit: ©Frank Gaude, reproduced with permission of the author. Scape unbranched, usually with 2 pseudoumbles of flowers, occasionally 1, 3 or 4. Pedicel ~20 mm. 5, connate at base, narrowly ovate, ~10 mm long. Hypanthium ~30 mm. 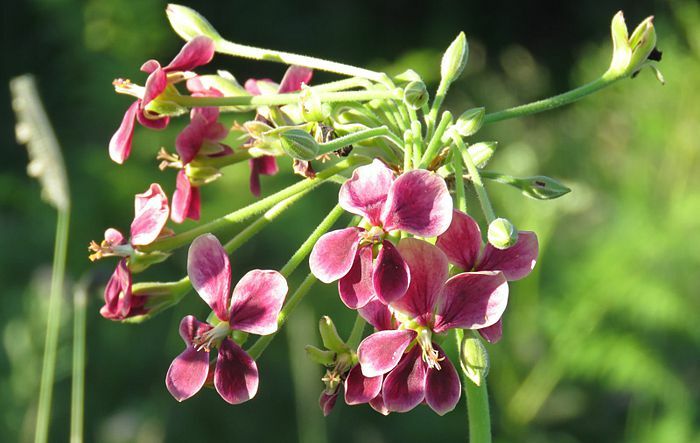 Obovate, 8-12 x 4-10 mm, bicoloured, mauve, maroon or purple in the centre, with yellow, dull yelow or white edges. 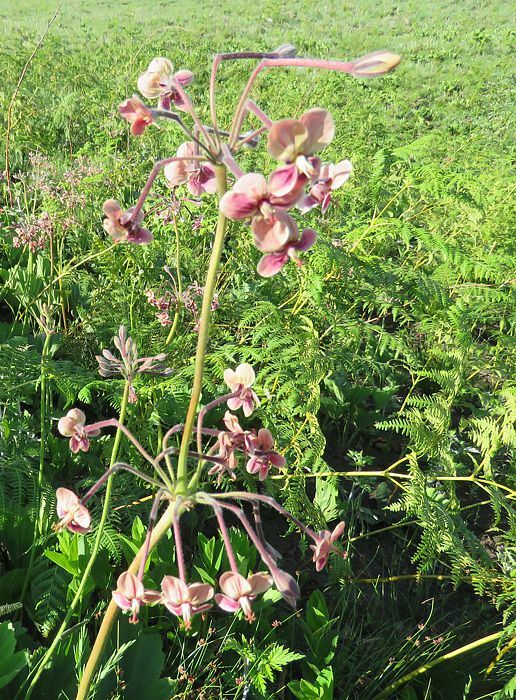 The typical two-tiered inflorescence of P. schlechteri clearly distinguishes this species from P. luridum, with which it used to be considered synonymous. Credit: ©Garth Bushell, reproduced with permission of the author. 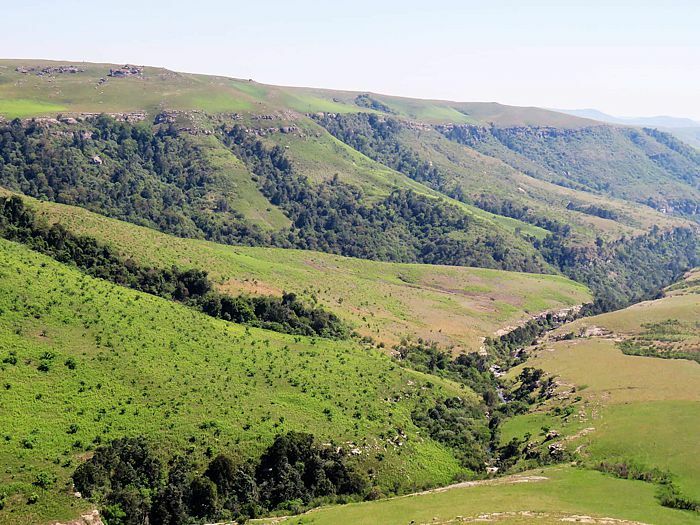 P. schlechteri is found on the steep, rocky grassland slopes of the northern Drakensberg, as high up as 2,000-2,400 m, but also occurs further east in KwaZulu-Natal, as well as in the Free State, Mpumalanga and the Eastern Cape. 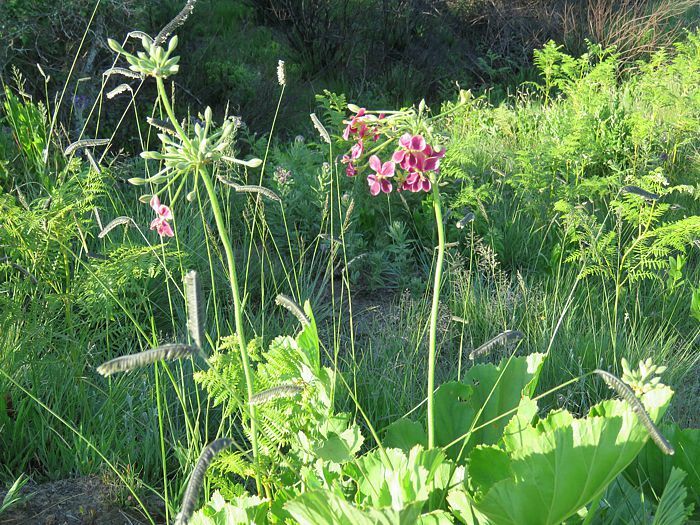 It grows in deep soil on stream banks or around large boulders. Credit: ©Garth Bushell, reproduced with permission of the author. 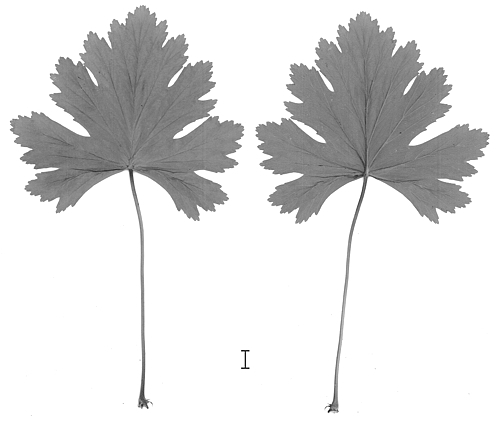 E.Retief, C. Craib, G. Condy: Pelargonium schlechteri. 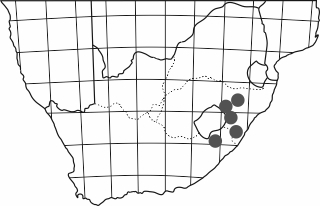 Flowering Plants of Africa 60 (2007) 84-88.